Clare has a deeply fascinating history and the kind of timeless beauty which can only evolve over many centuries. The Country Park, a haven of conservation and preservation as well as a place of recreation, a 13th century Priory and a great Gothic Wool Church. A 16th century hostelry and a number of pubs, some of great antiquity, all serving excellent food. Hotel accommodation and the traditional bed and breakfast are available in the town. There are a selection of antique shops and art galleries to visit, as well as a comprehensive range of excellently stocked shops. Check this section if you need somewhere to stay while visiting Clare. Restaurants, inns and other catering facilities. 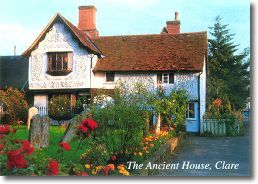 Clare Ancient House, one of the oldest houses in Suffolk, became the town museum in 1979. Notable for its superb plasterwork, an example of the local craft of pargetting which is still practised today. The museum illustrates the history of Clare and offers records viewable on computer documenting the histories of Clare houses and families from 1550. - A mediaeval town church - one of "England's Thousand Best". - with a membership of about a hundred people coming from all different denominations and experiences. - known to many of the locals as 'The Chapel". - This Roman Catholic church is located in the mediaeval Priory grounds. After the Battle of Hastings in 1066, William the Conqueror gave his cousin, Richard Fitzgilbert the Manor of Clare. Richard then started building Clare Castle. The ruin of the castle’s stone keep, which was built to protect the surrounding land, still remains today. There is a spiral path around the motte leading to the castle’s keep where a beautiful view of historic Clare can be seen. Clare Common is the site of the former Manor of Erbury which, following demolition of the extensive manorial building many centuries ago, has been used continuously as grazing land. It was given to the people of Clare by Katherine of Aragon (the first of Henry VIII's six wives) to be used as a Common Pasture for poor people. It is now administered as a local charity. Clare Nuttery is owned by Clare Town Council and forms part of the Dedham Vale and Stour Valley Countryside Project. The project works with local communities and landowners to help them improve their local environment. At the Nuttery we are creating a woodland that we can enjoy now and our great-grandchildren will one day cherish. Hundreds of young trees have been planted over the last 5 years, boundary hedges are being restored and a large pond has been given a new lease of life. There are paths winding through the trees, connecting two open glades and creating a lovely place to walk the dog, listen to the birds or have a picnic. Clare Priory, founded 1248, is the mother house of the Augustinian Friars in Britain. The Friars returned in 1953. 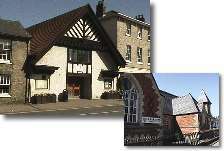 The religious community of Friars and lay people provide religious retreats, both day and residential; and the priory is the Town centre for local Catholics. The grounds and ruins are open to the public. Sheepgate Lane is the last remnants of an old drovers road adjoining the North side of the Common and is now part of the Clare Circular Walk. An entry for Sheepgate Lane can be found in the historic Domesday Book! Clare Walk is an easy 3.5 mile circular walk in the countryside around Clare using the Country Park as your gateway. The park is open every day for visitors. There is a pay and display car park in the Country Park. The route is clearly marked with green public footpath signs and yellow waymark arrows displaying a circular walk symbol enabling you to walk in either direction. Originally a corn exchange, the town hall was converted to it's present use back in 1912. In 1988, major alterations took place to create a venue suitable for a wide variety of functions and community uses. The Old School Community Centre was built as an Elementary School in 1862, later becoming a Primary School before finally closing in 1974. In 1989 major building work and refurbishment turned the school into Clare's Community Centre. SMICC is now in its 4th season of concerts -- this year’s quartet will bring the grand total to 17. 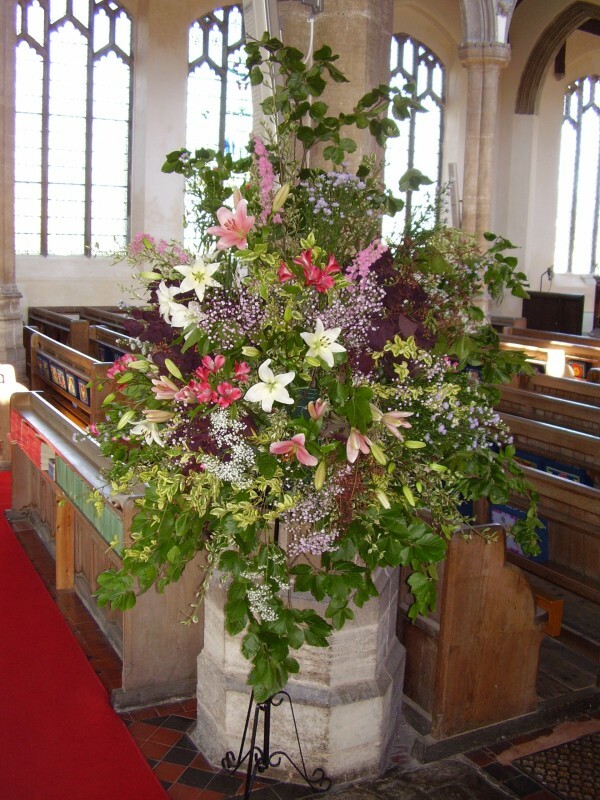 So far, we have contributed £2,000 to the Town Church running costs and a further £4,400 to the Church Restoration Fund, with more in our reserves. Raising money is our secondary aim. Our primary aim is to involve the church in the community -- to bring the Church to the people and the people to the Church. Our average audience is more than 150, meaning that well over 2,000 people have attended the 13 concerts held so far. Audiences this year will benefit from a big new stage. And the increase in our ticket prices will be marginal. Close by is Bury St Edmunds, an important market town with a richly fascinating heritage, the striking combination of medieval architecture, elegant Georgian squares and glorious Cathedral and Abbey gardens provide a distinctive visual charm. With prestigious shopping, an award-winning market, plus variety of attractions and places to stay, Bury St Edmunds is under two hours from London and very convenient for Cambridge.